Zelinsky, Paul O. Good. 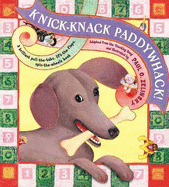 This book contains tabs to pull, wheels to spin and pop-ups, based on the well-loved "Knick-knack Paddywhack" counting rhyme. 16 p. Picture Puffin S. . Colour illustrations. Intended for a juvenile audience. Pop ups show wear, Signed by Author, Good solid copy, mild to moderate reading/age wear, no DJ if issued, may have some light markings or exowner inscription. We take great pride in accurately describing the condition of our books and media, ship within 48 hours, and offer a 100% money back guarantee. pp. 14. Full color paper over boards. Paper engineering by Andrew BaronPristine full color pop-ups and other moving parts. 14pp. Gift quality. Pristine book. Crisp, clean, tight, never opened/read. Issued without a DJ. Honors: New York Times bestseller. ALA Notable hildren's Book. Children's fiction. Children's audience. Paul O. Zelinsky. Very Good in None jacket. Color illustrations by Zelinsky and SIGNED BY ZELINSKY. No dust jacket issued. Record # 303490. Near Fine. No Jacket. 4to-over 9¾"-12" tall. Signed by Author UNION S M POP-UPS-Near fine larger hardcover. Signed by Zelinsky, all pop-ups work, minor edge wear. green/beige w/purple lettering. All Editions of Knick-knack Paddywhack!